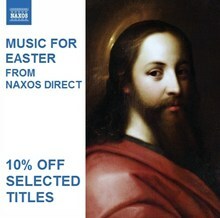 a cappella version heard on this recording to be sung in Russian Orthodox churches. 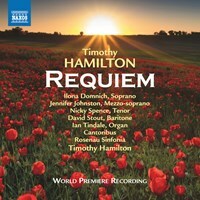 Commissioned in 2012 to commemorate the centenary of the outbreak of the First World War, Timothy Hamilton’s Requiem draws its inspiration from the Roman liturgy. 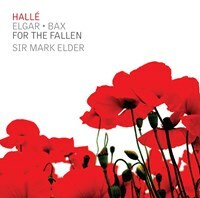 In twelve movements, it conjures up a vivid sequence of images depicting both the horror of war and the calmness and eeriness of the aftermath of battle, interspersed with moments of sombre and contemplative reflection most notably in the plangent setting of Isaac Watts’ Give us the wings of faith and the orchestral interlude Lest We Forget. The work builds to a powerful and moving conclusion with soprano and then chorus welcoming the souls of the fallen into paradise. One of England's most distinctive composers, George Butterworth belonged to the generation of young men decimated in the Great War of 1914-1918. His sensitive and melancholic settings of poems from A. E. Housman's A Shropshire Lad, with their subject matter of the futility and arbitrariness of war, are small-scale masterpieces. Of particular note are the 'Loveliest of Trees', describing the passing of the seasons, and the ghostly and elegiac 'Is my team ploughing?' The Folk Songs from Sussex and settings of poems by R. L. Stevenson, Shelley and Wilde, whose subject matter revolves around flirtation, love, courtship, marriage and desertion, are no less notable for their attention to detail, linguistic nuance and delicate, economical piano writing. 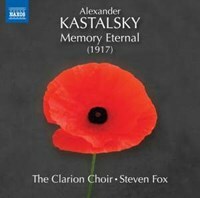 These composers were all affected by the carnage of World War I, and their elegiac music expresses regret and lost innocence, love won and lost, sacrifice and death. 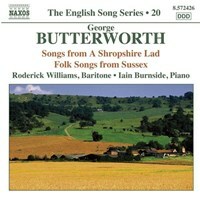 George Butterworth's A Shropshire Lad, conceived as an epilogue to his Housman song cycles, encapsulates the poet's sense of life's transience. Ivor Gurney was both shot and gassed in 1917, and The Trumpet pleads with mankind to set aside the folly of war. Heard here in a new completion, Gerald Finzi's Requiem da Camera mourns the death of his mentor. 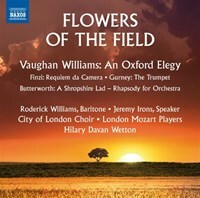 Ernest Farrar and those of other fallen artists, and Ralph Vaughan Williams's An Oxford Elegy recalls lost friends with an intense and magical nostalgia. As the centenaries of various events of the First World War are being commemorated, we are reminded of the great battles and the large-scale suffering. To imagine what day-to-day life may have been like in the trenches in Flanders is more difficult, however, 100 years later and with no living survivors of the war to bear witness. Poems and paintings can give us some idea – but, as this disc from Steven Isserlis proves, so can music! The main, more conventional section of the programme is a selection of cello works composed around the time of the war, by composers from three of the countries involved in it: France, Britain and Austria. This is followed by something rather more unusual, however, as Isserlis exchanges his ‘Marquis de Corberon’ Stradivarius for an instrument that was once played and heard in the trenches of Ypres. Harold Triggs, the owner of this so-called ‘trench cello’, brought it with him to Flanders from England – other soldiers, on both sides of the conflict, constructed their own violins, cellos or flutes on site, from ammunition boxes, pipes and whatever else they could get hold of. These instruments thus become a highly moving testimony to every man’s need for beauty and solace and joy, even in the middle of a battlefield. With the delicate support of Connie Shih on the piano (and in fact even pianos could be found in the trenches, even if not concert grands! 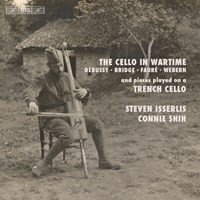 ), Isserlis and his trench cello transport us, for a brief moment, to a trench near Ypres during a quiet spell between skirmishes, with soldiers resting, writing home, playing cards – and with the help of the music – dreaming of a life elsewhere. 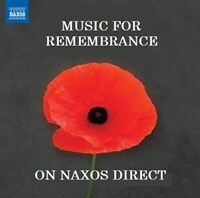 In the centenary anniversary year of the end of the First World War and on the eve of the 80th anniversary of the beginning of the Second World War, SOMM Recordings pays tribute to those who fought and fell in battle with In Remembrance. A moving compendium of music spanning 130 years, it features the Chapel Choir of the Royal Hospital Chelsea, the Choir of Chelsea Pensioners, Staff and Volunteers, sopranos Katy Hill and Leah Jackson, baritone Gareth John and organists James Orford and Hugh Rowlands under the direction of William Vann. Founded in 1682 by King Charles II, the Royal Hospital is home to the world-famous Chelsea Pensioners – retired veterans of the British army – whose contributions on three tracks adds its own special poignancy to In Remembrance. 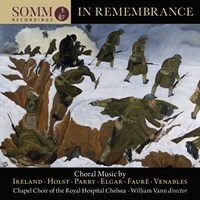 Moving choral works commemorating courage and offering comfort by Hubert Parry (his anthemic Jerusalem), Gustav Holst (the stirring I Vow to Thee, My Country) and Edward Elgar (his serene partsong They are at rest) are heard alongside equally affecting pieces by their contemporaries and successors, Charles Villiers Stanford, John Ireland, Douglas Guest and Charles Harris.